The RPA BPT Network comprises six hospitals which provides trainees a diverse clinical exposure within clinical medicine. Basic Physician Trainees in the RPA Network rotate through a number of these clinical settings and enjoy a wide variety of training opportunities. Our network operates on a 6/12/6 model. 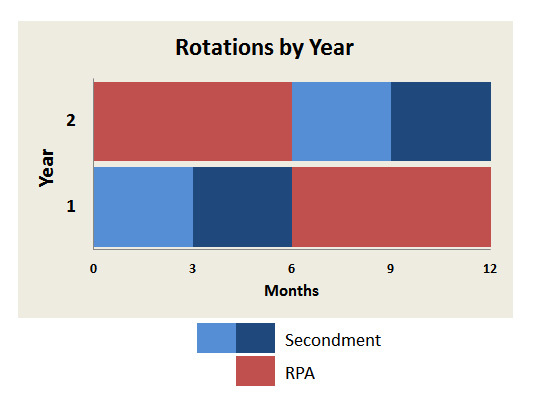 As shown in the figure below, trainees are initially seconded to our network sites outside of RPA for the first 6 months (2 x 3 month terms). They then return to RPA for the next 12 months (4 x 3 month terms) to take advantage of the structured training program for the RACP Written and Clinical Examinations. They will then complete their training with 6 months (2 x 3 month terms) on secondment once again. RPAH is a large, tertiary referral hospital in the inner west of Sydney. It remains one of the nation's most respected hospitals with a distinguished history of pioneering healthcare advances in Australia and serving the health needs of local, state, national and international communities. It is a major teaching hospital of the University of Sydney and offers a comprehensive range of clinical subspecialty exposure. Trainees also have the opportunity to complete a medical oncology rotation at the affiliated Chris O'Brien Lifehouse, a world-class, comprehensive cancer centre. Bankstown -Lidcombe Hospital is an acute, metropolitan general hospital with a large catchment area of south western Sydney, home to a diverse and multicultural population. It is a teaching hospital of the University of NSW and offers trainees a metropolitan, yet vastly different and valuable clinical experience outside of RPAH. A dedicated, site-specific training program, catering to the stage-specific needs of trainees is provided which is an important addition to the training program at RPAH. Located 5 hours west of Sydney, Dubbo Base Hospital is a major regional teaching hospital of the University of Sydney, providing an outstanding exposure to general medicine and specialist care in a rural context. Basic Physician Trainees rotate through formal general medicine, cardiology and nephrology rotations, but also have access to specialist clinicians and ambulatory medicine in the fields of gastroenterology, respiratory medicine, rheumatology, oncology and neurology. Located 3 hours west of Sydney, Bathurst Base Hospital is a major regional teaching hospital of Western Sydney University. It is a shared secondment site with the Nepean BPT Network and trainees from both networks are provided a rich exposure to general medicine in both inpatient and outpatient settings. With general physicians who are trained in cardiology, nephrology and gastroenterology sub-specialties, trainees have a wide variety of learning opportunities in both general and subspecialty medicine in a rural setting. The RPA Network is privileged to have a 'remote' rural attachment at Alice Springs Hospital. Whilst a major regional hospital, it provides access to a unique caseload and patient population and thus provides opportunities for learning that few Basic Physician Training programmes can provide. In addition, Alice Springs Hospital offers a distinctive cultural experience to complement an excellent clinical training and exposure.